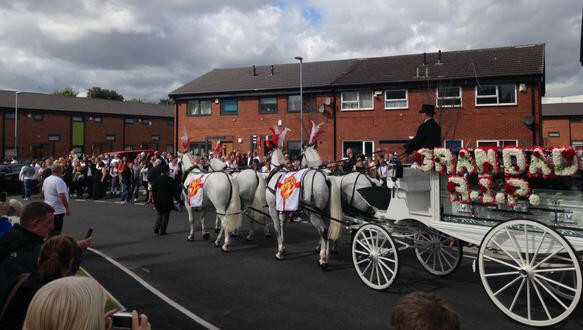 The funeral of Paul Massey took place today in Salford. His cortege was drawn by white horses draped in Manchester United flags as it made its way from Sedan Close, along Liverpool Street towards St Paul’s CE Church on Churchill Way. Adorning the horse-drawn carriage were the words ‘Salford Legend’. It was accompanied by the Fianna Phadraig Pipe Band from Wythenshawe and eight limousines as it made its way through the streets. Hundreds of people lined the route before the service started at noon. Greater Manchester Police said armed police would be on standby but uniformed officers will not be at the funeral. Mourners were asked to wear blue jeans and white shirts as a tribute to Mr Massey, who was said to have never worn a suit in his life. Mourners 30 deep made a guard of honour outside St Paul’s Church, clapping the white coffin through the doors as Shania Twain’s Still The One rang out across Broadwalk. Family and friends went on to a private wake at the Lower Kersal Social Club on Stamford Road. The 55-year-old was shot to death outside his home in Clifton, Salford, on Sunday 26 July. His killer has still not been apprehended and no arrests have yet been made.